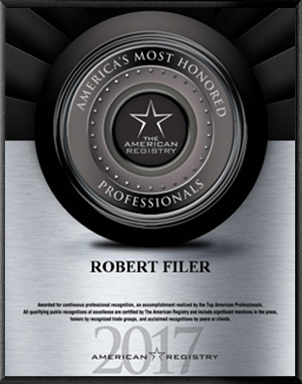 The American Registry Has Named Dr. Robert Filer One Of America's Most Honored Professionals! Due to his immense skill as an ophthalmologist, Dr. Filer has been named within the top 1% of America's Most Honored Professionals for the year of 2018 by The American Registry. Dr. Robert Filer Honored With The On-Time Doctor Award For 2018! 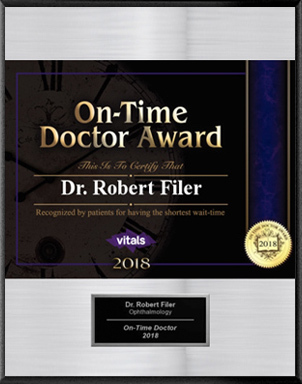 Vitals has awarded the On-Time Doctor accolade to Dr. Robert Filer for 2018 due to his prompt patient care and having one of the shortest office wait times. California Ophthalmologist Robert Filer Named One of 2018's Most Compassionate Doctors! With impeccable bedside manner and individualized patient care, Dr. Filer has been rewarded the Compassionate Doctor Award of 2018 by Vitals. 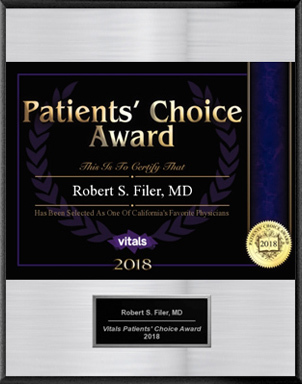 Vitals Extends The 2018 Patients' Choice Award To Dr. Robert Filer! 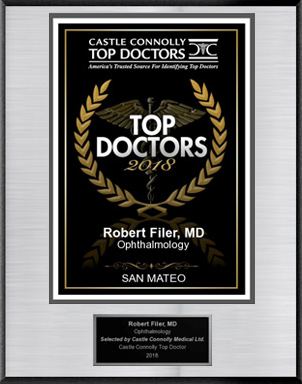 Dr. Robert Filer, an ophthalmologist in San Mateo, has been selected as one of California's favorite physicians for his impeccable skill as an eye doctor and his individualized approach to patient care. 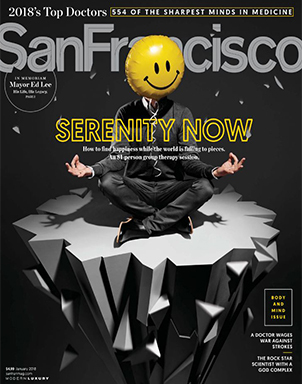 San Francisco Magazine Features Dr. Robert Filer As A 2018 Top Doctor! 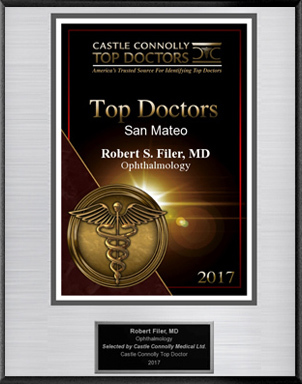 Dr. Robert Filer, a San Mateo Ophthalmologist, has been featured in San Franciso Magazine as a top doctor for the year of 2018 by Castle Conolly. Castle Connolly Names Dr. Robert Filer As A Top Doctor In 2018! After a rigorous review of potential candidates, Castle Connolly has named Dr. Filer as a Top Doctor for 2018. Dr. Filer Named Among The Top 10 Best Corrective Eye Surgeons For 2017! 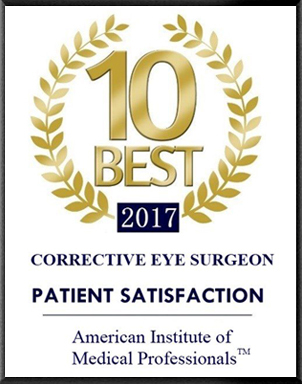 The American Institute of Medical Professionals has recognized Dr. Robert Filer among the top 10 best corrective eye surgeons in 2017! Dr. Robert Filer Named A 2017 Top Doctor By Castle Connolly! Dr. Robert Filer has been named a top doctor for 2017 by Castle Connolly. Top doctors are nominated by colleagues and are subject to a rigorous review of their practice, medical credentials, and more. Dr. Robert Filer Named Among America's Most Honored Professionals In 2017! 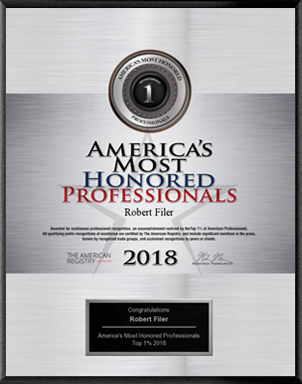 After close evaluation of all nominees, The American Registry has named Dr. Filer as one of the most honored professionals in America for the year of 2017. 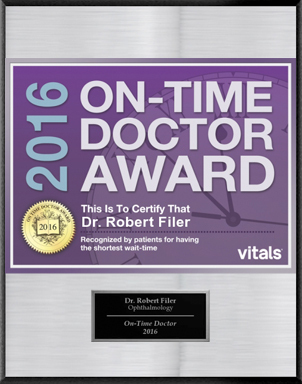 Dr. Filer Receives The On-Time Doctor Award For 2016 From Vitals! Dr. Robert Filer has been recognized by Vitals for his prompt patient care and short office wait time for 2016. 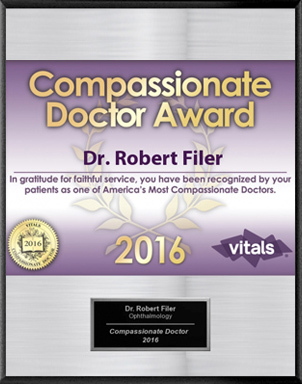 Vitals Presents Dr. Robert Filer With The Compassionate Doctor Award In 2016! Dr. Filer has been awarded the compassionate doctor accolade in 2016 for his individualized approach to patient care. 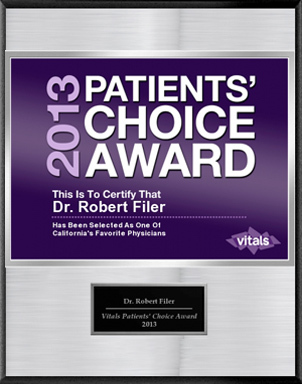 Dr. Filer Has Received The Patients' Choice Award For 2013 From Vitals! Dr. Filer has been selected as one of California's favorite physicians for 2013 due to his skill and talent as an ophthalmologist. 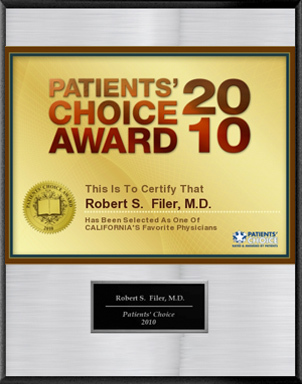 California Ophthalmologist Robert Filer Awarded The 2011 Patients' Choice Award! 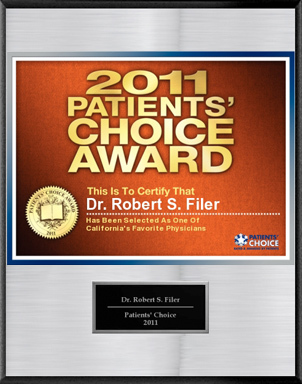 Dr. Filer has been awarded the Patients' Choice Award in 2011 and named one of California's favorite physicians. This accolade means that Dr. Filer was nominated by his patients for his superb ability as an ophthalmologist. 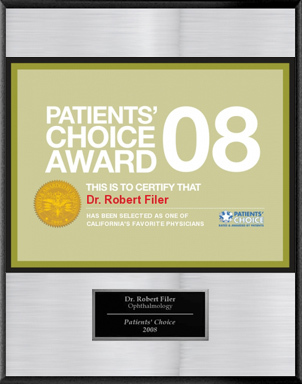 Patients' Choice Accolade Awarded To Dr. Robert Filer For 2010! Dr. Filer, a highly respected ophthalmologist in San Mateo, has been chosen as the recipient of the Patients' Choice Award, which has named him as one of California's favorite physicians. Dr. Robert Filer Presented The Patients' Choice Award For 2009! Dr. Filer has been selected as the recipient of the 2009 Patients' Choice Award. This award recognizes that Dr. Filer's patients rate him among the best physicians in California. 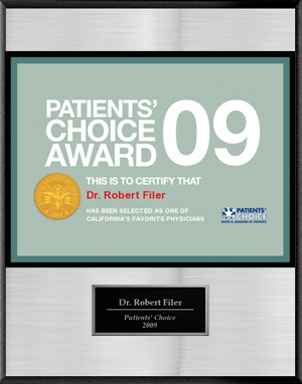 Dr. Robert Filer Named One Of California's Favorite Physicians In 2008! Dr. Filer has received the Patients' Choice Award for 2008 and has been named as one of California's favorite physicians by his patients. 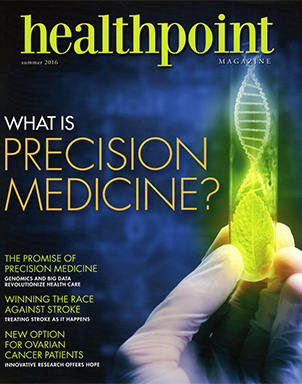 Healthpoint Magazine Features Dr. Filer For His Expertise On Eye care! Dr. Filer discusses long-term eye care and preventive measures that can be taken to ensure healthy vision as you age.